Kenny Burrell – 2010 Grammy Jazz Honoree of The Year. Kenneth Earl “Kenny” Burrell was born July 31, 1931 in Detroit, MI and by 12 years old, started playing guitar (similar to yours truly who started playing at the age of 14). Little did he know that he would be this year’s Grammy Jazz Honoree. I don’t know who is more excited, Kenny or me. He has certainly been my favorite jazz guitarist for as long as I remember. Kenny’s choice as this years honoree is quite a substantial one, in my mind. His discography alone proves his ability (and history) of being a superb sideman and solo musician in his own right. Between the years of 1956 and 2006, Mr. Burrell has excelled as a leader, co-leader and sideman releasing recordings with stellar musicians in the world of jazz. His last release, Kenny Burrell: 75th Birthday Bash Live! released in 2007 on the prestigious Blue Note label, not only has a historic playlist of wonderful jazz standards, but showcases prominent musicians such as Joey DeFracesco, Hubert Laws, Snooky Young, and the like. During that same year, he began his tenure as Director of Jazz Studies at UCLA. He has recorded on well respected jazz labels including Prestige, Verve, Fantasy, and Concord Jazz. 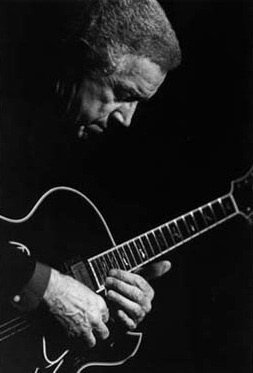 Kenny Burrell posesses a unique style (and grace) if you will, defines the essence of jazz guitar. His playing easily brings to life the stellar arrangements of his great predecessors, Duke Ellington and Billy Strayhorn and, in addition, has away of conveying the cool that IS jazz. If there was to ever be a true definition of “smooth jazz”, Mr. Burrell would undoubtedly be a defining factor. His remake of Neal Hefti’s classic song “Girl Talk” is one of my favorite tunes.